Following droughts in the 1930s that affected most of North America, major conservation efforts, both private and governmental, were enacted to reverse trends of degrading and disappearing wetlands. During this time period there was a major creation and expansion of Federal refuges and State wildlife areas. As the concept of waterfowl flyway management was endorsed and developed, wildlife areas were acquired and managed as part of a larger plan focused on migratory waterfowl needs. Klamath Wildlife Area was one of several wetland-focused wildlife areas established in Oregon. KWA was established in 1958, with primary objectives of protecting and improving waterfowl habitat and providing a public hunting area. Best time to visit: February through November. Highest concentration of waterfowl occur from late winter to early spring and late summer to early fall. The highest concentrations of spring migrating geese occur from late February to early April. March through June is the best time for viewing migrant waterbirds and songbirds. Visiting hours: Klamath Wildlife Area, Miller Island Unit is open daily from 4:00 am to 10:00 pm. What to see and do: Klamath Wildlife Area is managed to provide habitat for wintering and nesting waterfowl, upland game birds and a variety of other wildlife. Bald eagles, American white pelicans, Greater sandhill cranes and upwards of 70,000 spring migrating geese are among the birds present during certain times of the year. Due to its geographic setting, species diversity and abundance of wildlife present, Klamath Wildlife Area is a popular destination for hunting, wildlife viewing and environmental education. Wildlife: A few species you may observe throughout different times of the year are western pond turtle, northern river otter, long-tailed weasel, muskrat, tundra swan, Ross’s goose, greater white-fronted goose, northern pintail, cinnamon teal, canvasback, California quail, golden eagle, rough-legged hawk, barn owl, western grebe, great egret, white-faced ibis, Virginia rail, American avocet, western sandpiper, dunlin, caspian tern, black phoebe, tree swallow, yellow-rumped warbler, golden crowned sparrow, yellow-headed blackbird and American goldfinch. Facilities: boat ramp, camp host, ADA accessible, fishing, hunting, restrooms, picnic areas, dog training area and trails. Nearby: Klamath Basin is one of the top birding locations in the nation with multiple national wildlife refuges including Upper Klamath Lake, Lower Klamath and Tulelake all within 40 miles of Klamath Falls. 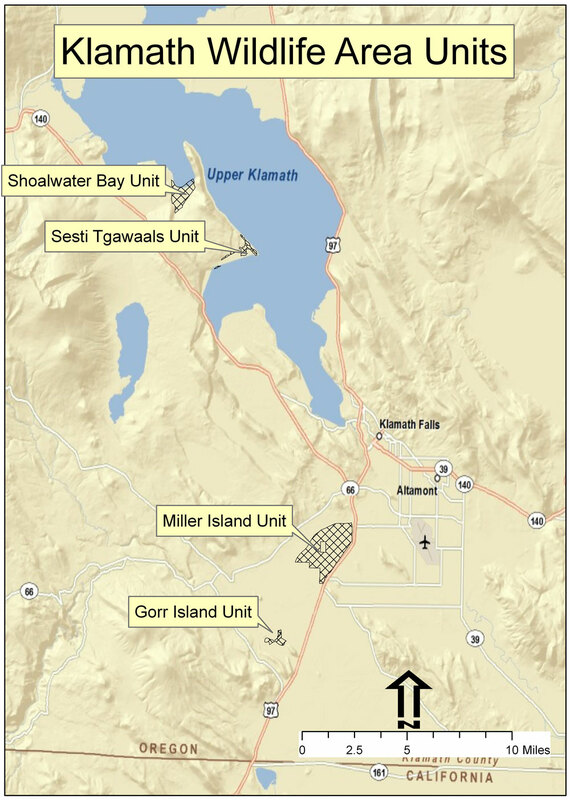 Directions: The wildlife area is located four miles south of Klamath Falls on Hwy. 97. The area is west of the highway and extends south 2.5 miles. Miller Island Road West goes through the area.